Helen Cammock is an artist and artist facilitator. She graduated from the Royal College of Art in 2011. She has previously facilitated projects for PhotoVoice, London, The Photographers Gallery, London Open School East – London, Brighton Photo Fringe and Photoworks. 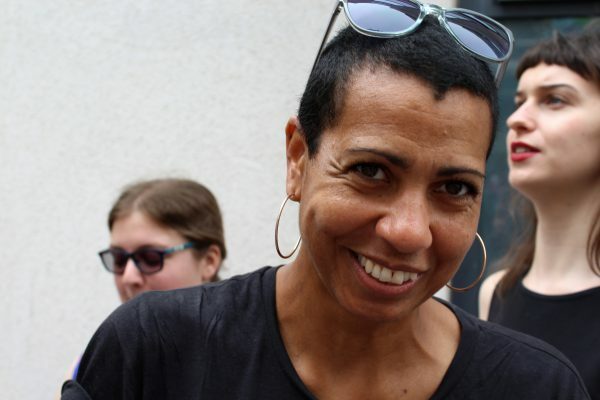 She lectures across the UK on participatory practice and is committed to exploring and evolving the way participation opens up dialogue, and aims to ensure that diverse voices are platformed in the cultural contexts she works in. As an artist she has a mixed media practice, which considers how individual and collective experiences embody the consequences of structural inequality by exploring differing societal experiences within systems of representation. She weaves different contexts and forms together and her fragmented narratives cross boundaries of time and place. Forthcoming projects include a Serpentine Screening evening and a commission with Bookworks, London and Freedom Festival in Hull. Recent screenings/exhibitions include: Open Source Contemporary Arts festival, May 2016; Transform, Tate Artists Moving Image Screening Programme, Tate Britain, 2015; You don’t need a weather man to know which way the wind blows, Hollybush Gardens, 2014; London Art Now, Lodge Park National Trust, 2013; Oriel Davis Open, 2012; Out of The Archives, The Women’s Library London, 2009. She has written for Photoworks and Aperture Magazine and was shortlisted for the Bridport poetry prize in 2015. Helen was co-director of Brighton Photo Fringe Festival for 4 years.